"White Lightning, bound to drive you wild"
A highlight of the Flying Legends airshow 2011 was the UK début of the Flying Bulls’ striking P-38 Lightning. Over the weekend of 9-10 July, the Lightning wowed the large crowds with its elegant routine. 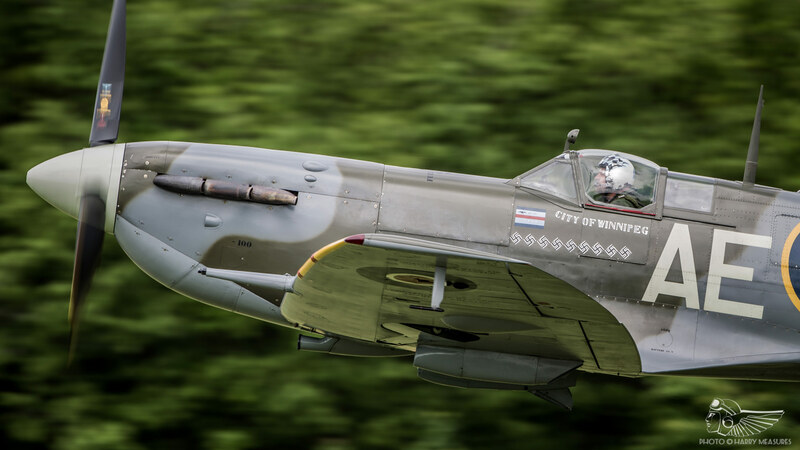 For its pilot, Raimund Riedmann, displaying at Flying Legends was the culmination of a personal journey that began decades earlier at the very same airfield. The last P-38 to be seen at Duxford was The Fighter Collection (TFC)’s flagship aeroplane, California Cutie, so tragically lost in the crash that took the life of Michael ‘Hoof’ Proudfoot in July 1996. Circumstances dictated that it would be 15 years before a Lightning returned to Duxford (the 2007 attempt to fly Glacier Girl across the Atlantic failing when the aircraft fell unserviceable during an early leg of the trip). “It was emotional for TFC too, especially for Stephen and Nick Grey”, he reflects. “They saw in the Lightning something they had missed for years, that has so much significance and history for them. I was very aware of that and wanted to fly a very respectful sequence. After my display, Hoof’s widow came to me and of course she was very emotional, but she thanked me for flying. That was the most emotional moment I’ve ever had in my flying career.” Raimund has been a regular visitor to Duxford since that first trip in 2011, demonstrating the Lightning in 2012, 2015 and 2016 respectively. “It never stops being special, arriving at that airfield”, he says warmly. Raimund first visited Duxford during a school trip three decades ago when, as a young boy hoping to see one of the many based warbirds fly, he stood patiently on the fence all day in anticipation. It was not to be, however – the residents remaining firmly on the ground on that occasion – but the visit fuelled an interest in aviation that has shaped Raimund’s life for years hence. His was an infatuation that dated back to childhood, a burgeoning adolescent interest progressing naturally to glider flying and eventually to his Private Pilot’s Licence, with which he spent many hours honing his aerobatic skills flying light aircraft. By the late 1990s, he was co-piloting executive business jets for Tyrolean Air Services at Innsbruck, Austria; work which occasionally brought him back to the UK and, when time allowed, to Duxford. The yearning to fly vintage aeroplanes was never far away, and it was through his association with Tyrolean Air Services’ Sigi Angerer that Raimund was afforded the opportunity. He flew first the small fleet of classic aeroplanes operated privately by Sigi, amongst them the Grumman G44 Widgeon and North American T-28B Trojan, before progressing to a true American thoroughbred fighter in the form of the Chance Vought F4U-4 Corsair. The Corsair in particular garnered interest from Dietrich Mateschitz, founder of global energy drink giant Red Bull, and through his relationship with Sigi Angerer the Flying Bulls concept was born. Their desire to own and operate unique aeroplanes led to the acquisition of P-38 F-5G-6-LO Lightning N25Y, which arrived at Salzburg, Austria, in 2007. Post-war, N25Y was famously owned and flown by the late Marvin ‘Lefty’ Gardner under the moniker White Lightning, adorned with a striking red, white and blue custom paint scheme befitting its civilian career as an air racer. 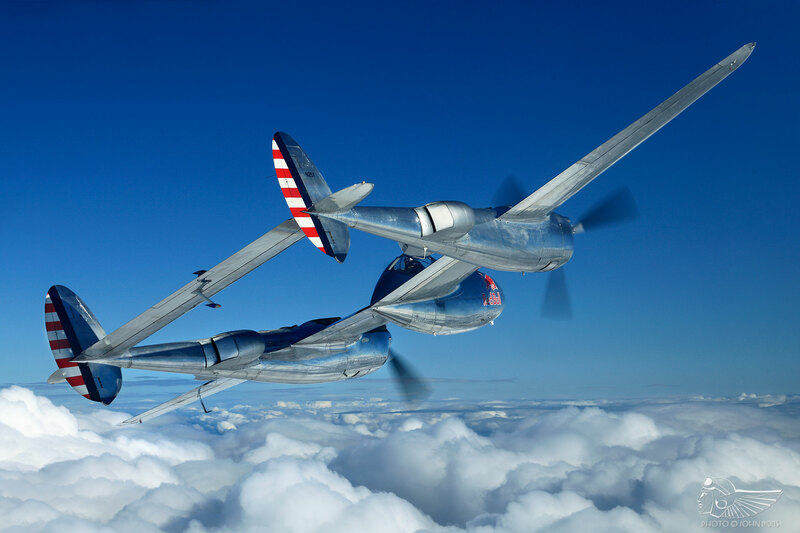 Following a critical engine fire and emergency landing in a cotton field on 25 June 2001, the damaged P-38 was sold to Red Bull and underwent a major overhaul with Ezell Aviation, TX, prior to its relocation to Europe. 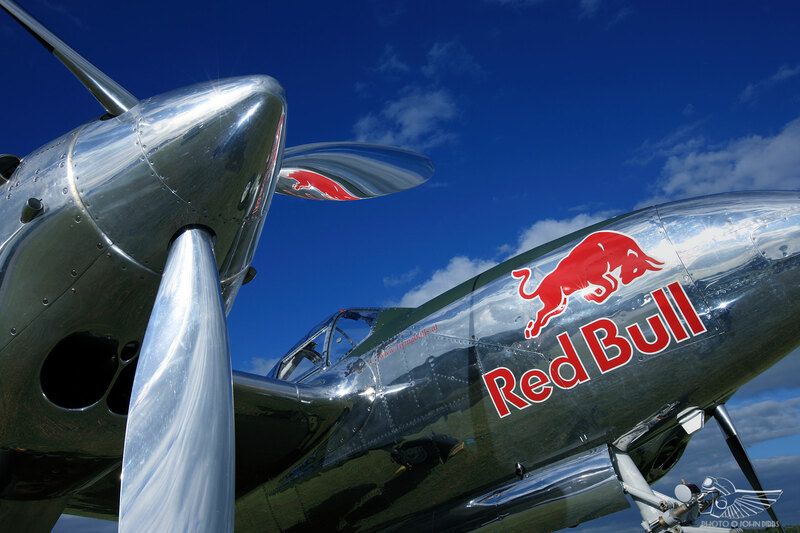 Under Red Bull’s ownership, the Lightning is displayed in a beautiful, if controversial, polished bare metal finish somewhat reminiscent of the prototype P-38, albeit with the company’s logo adorning the forward fuselage. A North American B-25 Mitchell had also joined the ranks the year Raimund started flying for Tyrolean Air Services, and it was in this aircraft that he got his first taste of flying a large twin engine warbird. After several years spent co-piloting the B-25, he travelled to Chino, California, to undergo P1 conversion training on a resident Mitchell. Having consolidated his twin experience captaining the B-25 and Widgeon, and after many hours of “ground flying” the P-38 and studying its manuals, the chance arose to fly the Lightning for the first time. At the conservative power settings the Lightning is flown at by its current operators, engine management is minimal: automatic coolant flaps ensure the engines receive the requisite air flow, whilst manual oil cooler flap operation becomes second nature after a couple of flights. Careful monitoring of altitudes and speeds is required at the critical range of 90 to 130 knots, particularly on approach where the aircraft becomes more sluggish, and forward thinking needs to be given to ensure that the correct attitudes and speeds are maintained as with any vintage aeroplane.  In the landing pattern the large wing area can obscure local air traffic, necessitating vigilance until the aircraft is safely on the deck. A speed of 100-110kts on final to land and a touchdown speed of 90kts (as low at 85kts when the aircraft is light on fuel) will see the Lightning comfortably carrying out a full-stop landing on just 2,000ft of runway. With its tricycle undercarriage arrangement offering much improved visibility over contemporary tail dragging warbirds, ground handling is particularly pleasant, with none of the weaving that it typically required from aircraft of the era. 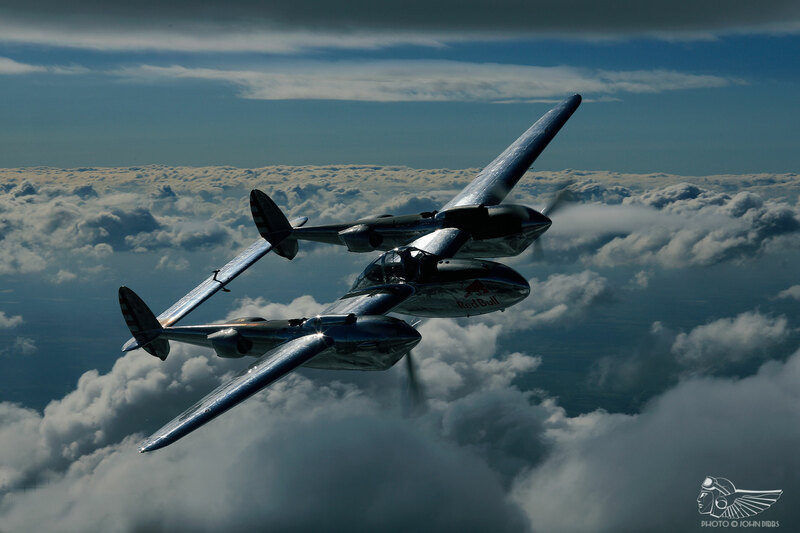 Having worked up a routine over a number of years, Raimund now flies a fully aerobatic display sequence in the P-38, comprising reverse-Cubans, loops, half-Cubans, barrel rolls and aileron rolls that demonstrate the aircraft’s full certified flight envelope to the public. He drew inspiration from ‘Lefty’ Gardner, whose theatrical air displays were a hallmark of many US airshows decades ago, to draw up a sequence of aerobatics that “flows smoothly and looks good for the public who have paid to see you”. Whilst you won’t see Raimund flying aerobatics with one engine shut down a la ‘Lefty’ Gardner, his style of flying emulates the grace and lyricism of his American forebear’s sequences in the very same aircraft. As fate should have it, Raimund had the fortune of meeting Ladd Gardner, son of ‘Lefty’ and himself a former White Lightning pilot, at the Flying Legends airshow two years after his father died. “That was another emotional moment, again at Duxford,” Raimund recalls, “when Ladd approached me after the show and told me he enjoyed my flying and that his father would have liked it. It meant a lot to hear that from the son of an aviator I looked up to”. During his displays, Raimund flies yo-yoing aerobatic figures from a base height as low as 50 feet and a gate speed of almost 400kts, penetrating vertically to around 5,000ft during his first manoeuvre. With climb power set at 44 inches manifold pressure and 2,700rpm on each of the twin 1,600 horsepower Allison V1710-111/113 engines, the Lightning’s impressive power-to-weight ratio and sleek aerodynamic profile allow it to fly elegant, sweeping aerobatic figures with a sympathetic G loading (typically in the region of 4Gs, less than half of the 9Gs the aircraft is capable of) at entry speeds in the region of 330-390 knots, slowing to 120-150kts at the 3,000 to 4,000ft apex of each manoeuvre, throughout the routine. That trade of height and speed is an important element of risk mitigation. In the event of a sudden engine failure, the torque of the operational engine’s outward-rotating propeller could roll the aircraft inverted unless the respective throttle and propeller levers are not closed to idle power within a matter of seconds. Whilst the Flying Bulls do not train for mid-aerobatic engine failures, these emergency procedures are something Raimund and his colleagues practice within a controlled environment by performing handling tests with one propeller feathered to simulate a stricken engine. Under the Flying Bulls banner, Raimund has taken the Lightning to events across Europe, covering vast expanses of land and sea en route. These transits are aided and simplified by the P-38’s controversial modernised cockpit, a source of much consternation amongst enthusiasts. 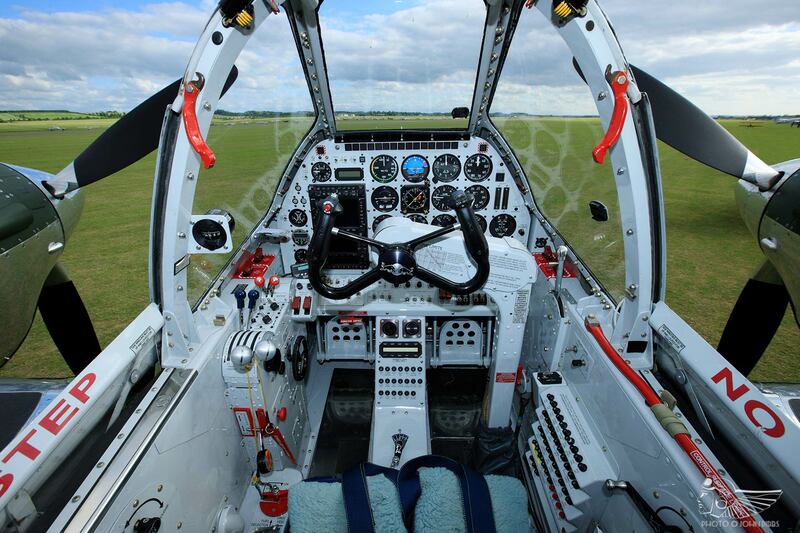 Whilst several of the key engine instruments such as the manifold pressure, tachometer and engine temperature and pressure gauges are original, much of the rest of the cockpit has been custom fitted with bespoke instrumentation. This gives the Lightning the ability to fly in cloud and adverse weather under Instrument Flight Rules (IFR), rather than the Visual Flight Rules (VFR) the majority of historic aeroplanes are limited to. Whilst Raimund and his colleagues avoid flying in poor weather, the IFR capability enables the ‘Bulls to climb through heavier cloud and rain to continue their transit flights, without having to consider long-distance and costly weather diverts. Another modern touch is an exhaust gas temperature monitor which operates in tandem with an integrated data storage card, much like those installed in many modern automobiles and aircraft, which can be removed and downloaded to computer for diagnostic analysis by the Flying Bulls’ maintenance team. This, Raimund says, helps to identify potential engine issues before the aircraft’s temperature gauges would suggest there is a problem, which in turn assists with the long-term preservation and operation of the aircraft. Indeed, overheating has proved troublesome in the past, and whilst the Allison is a reasonably reliable power plant, the Flying Bulls team have experienced their share of difficulties with Raimund recalling two such occasions where he has lost power in one engine (one of which necessitated an engine change following further inspection on the ground). 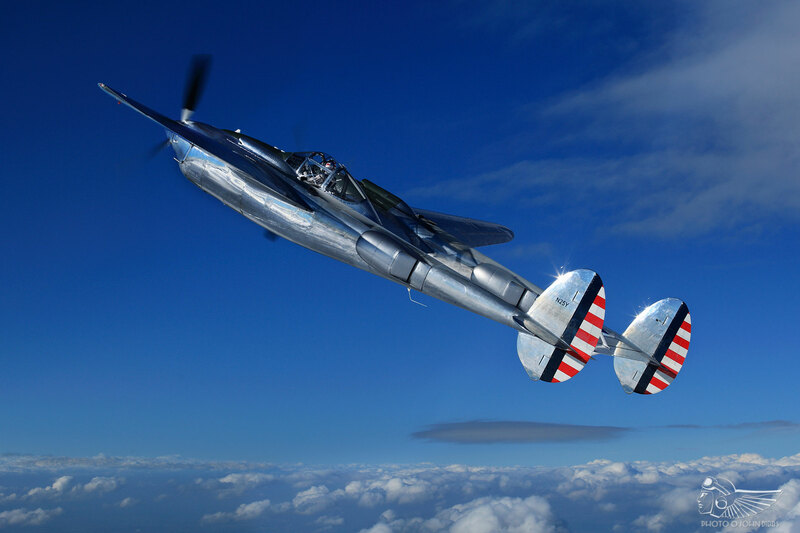 That enjoyment is something that becomes abundantly clear when Raimund recounts his experiences flying the P-38 Lightning over the last few years. The passion and yearning for flight’s expressive freedom hasn’t left him since those eager visits to Duxford as a boy. With Red Bull’s support, he has had the opportunity to fly the Lightning as part of a close formation aerobatic duo alongside his good friend, Eric Goujon, who pilots the Flying Bulls’ Corsair. That pairing offers its own unique challenges, the dissimilarities between the two aircraft requiring constant throttle adjustment in the P-38 to match the Corsair’s performance with the application and reduction of power in the climb and descent respectively. More recently, Raimund and his colleagues have mastered flying mixed piston and jet air displays, choreographing a vertical aerobatic sequence with the Lightning leading the Corsair and a pair of Alpha Jets in close box-four formation. The unique spectacle of high performance warbirds and jets flying loops, half-Cubans and rolls epitomises the pioneering spirit of the Flying Bulls and, indeed, the zest for aviation that Raimund himself has had since childhood. 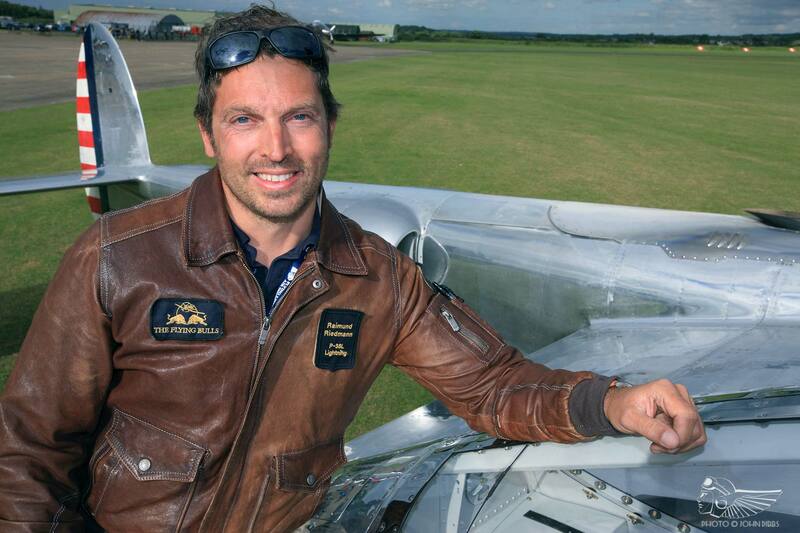 “I would never have thought I’d have the luck to be in a position to fly aeroplanes like this. I never dreamed it could happen”, he reflects. “When you’re flying, you’re looking down at the earth unfolding and your problems are getting smaller. Pure enjoyment takes over, and an overwhelming feeling of luck. Your mind wanders and you think about the great aviation philosophers and their view of the world. Why have you been given that honour? How have you come to fly a precious piece of history when so many others who share your passion will never have the chance?